Al Templeton (owner of Al’s Diner) found a time portal. Whenever he uses it, it drops him in Lisbon Falls, Maine, on the morning of September 9, 1958. That’s over five years before John F. Kennedy will be assassinated. Al thinks he can live in the past long enough to save the president. But the past is obdurate. (That’s King’s word. Good one, too, isn’t it? It means obstinate, callous, unbending.) The past doesn’t want to change. Lord knows, Al has tried, but he’s now running out of time. He decides that he needs to recruit someone younger for the job, so he calls on local schoolteacher Jake Epping, who is in mid-30s, divorced, honest, caring, a real straight shooter. "11/22/63 isn’t classic King. This is the New & Improved King, and you’ve never seen anything like it. It’s the best of the best. For me, it’s the Story of the Century." Once Jake gets beyond the initial you-must-be-crazy conversation and the flaming doubt spawned by Al’s fantastical suggestion, he agrees to give it a go and makes a trial run. After just a few months in 1958, he returns to 2011 (where only two minutes have passed, just like Al said). Time is of the essence, as they say, so Al pushes Jake with a huge nudge, leaving Jake little choice but to take up the endeavor. Very shortly, Jake is back in 1958, with some ID showing him to be a man named George Amberson, carrying a sizable sum of old money plus some financial insurance in his briefcase in the form of winners’ names in future sporting events. Jake/George settles into his new era, planning how to use the years until he can try to prevent Lee Harvey Oswald from shooting Kennedy. He has an idea or two, and they could save lives. But, as mentioned before, the past is obdurate. It pushes back. George shouldn’t have, but he finds himself sidetracked by love. Maybe blindsided is more accurate. At any rate, the lady Sadie steals his heart and clouds his thinking. But, boy, do they dance! Every page is a blast to the past: dimmer switches on the floors of cars, rabbit ears on TVs (and the frustration of the picture rolling as you try to tune it), gas at 19.9 cents for regular, lobster going for 69 cents a pound, pay phones charging a dime for a local call. Not to mention the music! King always treats you to great music. To quote George Amberson: Dancing is life. What separates King from the herd is extraordinary texture and multi-dimensional characters who will live with you forever after meeting them once. And he always sets his tales in small towns, partly because he knows them so well, and there’s an intimacy in them that the mega population of cities just can’t match. So we begin in small-town Maine and travel eventually to Dallas. And then…back again? We’ll see. There’s a fun bonus here, too. If you’ve read King for as long as I have, you might recognize a few old friends --- or enemies --- from past novels. It’s a huge delight finding a familiar name pop up on a page. Or two. Or three. I don’t believe I have ever called an 800-plus-page book a quick read. Until now. 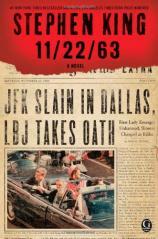 11/22/63 isn’t classic King. This is the New & Improved King, and you’ve never seen anything like it. It’s the best of the best. For me, it’s the Story of the Century."